[Here’s the latest Japanese toy find report from Luke Rook. Apologies on the transmission delay on this one…]. Here's a sneak peak at Real x Head newest mini, the Mini Mutant Daruma. Just like Mori's Mutant Cats, the Daruma puts RxH's stamp on traditional Japanese culture. Traditional Japanese Daruma dolls, (sometimes also called Dharma dolls) are round, hollow Japanese dolls with no arms or legs, modeled after Bodhidharma, the founder of Zen. The doll has a face with a mustache and beard, but its eyes are blank white. The left eye is filled in with black as a symbol to a commitment towards a goal, a wish, a start of a new venture for good luck, and so on. When the wish or goal later comes true, the second (right) eye is filled in. The most common color for Daruma dolls are red (thus the first release color), followed by yellow, green & white. Right around the same size as the mini Fortune Cat. 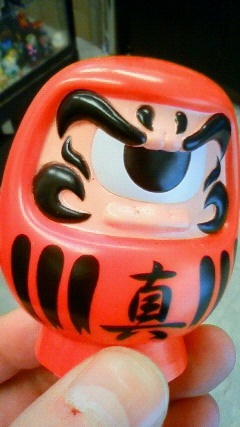 This first Daruma has the classic "Shin" kanji; which means "real" or "true"; and is the first character in Shinto Gangu; which is the name of the RxH store itself. Like the mini cats, there are sure to be many more colors and kanji's in the near future. If you are in the neighborhood, grab one in store at Real x Head Wed - Sun from 6 to 9pm, or for our US friends right here.